Info about some of the people behind the lights. 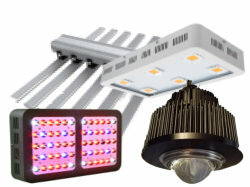 EconoLux Industries Ltd. is the worlds first Horticultural/Plant/Grow light company to make LED lights with a 90% to 95% match to the McCree curve, and a close match to natural sunlight. Here you can find out more info about us, our manufacturing facilities, and our OEM department which can creates any format and spectrum of LED lights you desire, as your own brand. EconoLux Industries has developed our own proprietary technologies and manufacturing processes. We have a number of patents-pending in Induction Lighting and LED lighting technology. We have implemented these patent-pending and trade-secret technologies to bring you innovative products which incorporate significant advances in operation and features. Our "green", environmentally friendly, energy saving lights and fixtures, help reduce your "carbon footprint", and is one small way to help reduce the effects of global warming from greenhouse gasses (Co2). 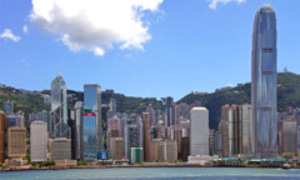 Our registered Head Office (administration functions only) is located in beautiful Hong Kong, in the Kin-On Commercial Building, Jervois Street, in the Sheun Wan district of central Hong Kong. Kong Kong is the largest financial and shipping hub in all of Asia allowing you to take advantage of multiple shipping options to get our products to you as fast as possible. Our R&D and product design office is located in Canada, while our sales and technical support office is located in the Longgang district of Shenzhen. Our factories are located in Bo'an district of Shenzhen (LEDs) and Longgang (housings/fixtures) districts of Shenzhen. Michael Roberts is the Chief Technology Officer and "mad scientist" of EconoLux Industries. He was born of Canadian parents in the Republic of South Africa. He moved back to Canada, via a year in Europe, in his late teens to correct the situation. His father was an audio and electronics engineer and a radio amateur (ham). He influenced Michael's early interest in electronics and mechanical devices. In school Michael studied the regular subjects along with art, art history, classical and vocal music and was involved in his school AV club and theatre productions. Michael designed and built his own laser system and was the first in Canada to offer "have laser - will travel" services. He has performed laser shows for major corporations, designed choreographed and performed laser and fireworks spectaculars, created movie special effects, toured internationally with renown rock bands, and even performed for Her Majesty Queen Elizabeth II. Michael has received multiple international awards for his laser work. Michael retired from the laser industry in 2003 when he became interested in renewable resources and "Green Technology". He then became CTO of InduLux Technologies Inc., a Canadian R&D and Intellectual Property company where he conducted and managed research on UV water purifying equipment, and magnetic induction lighting technology, including induction plant/grow-lights. Michael was interested in the potential for Induction Lighting to provide energy savings in the agricultural sector. Lights used for growing plants are predominantly Metal Halide and High Pressure Sodium, thus they use a lot of power and generate a lot of heat. Two years of R&D later, and Michael had invented the world's most energy efficient plant growing lights with a spectral output that has a close match to the PAR curve. Michael founded EconoLux Industries to build and market the proprietary induction grow/plant lights. When LEDs became more efficient than Induction lamps, and more wavelengths became available allowing for better spectrum designs, Michael transitioned his proprietary technology to LED plant/grow lamps, so that greenhouses and vertical farms can enjoy the energy savings and spectrum impotent benefits at a lower cost. Michael Roberts is an inventor with two granted patents in UV water treatment technology. He also invented the world's first LED COB plant/grow light engines with a close match to the PAR curve. This was followed by the invention of the world's first McCree curve LED COB with a 90+% match to the McCree curve, and a close match to natural sunlight - these inventions are the basis of many of EconoLux's products. Michael has provided presentations at number of educational establishments including the University of Waterloo in Canada, SENAI in Rio De Janeiro, and Fudan University in Shanghai. In addition he has made presentations at energy efficiency, low carbon, and other conferences and seminars across Canada, and in the EU. Neo has a four year degree in mechanical engineering. Before working with EconoLux, he had over two years of experience in the design, programming and maintenance of automated and robotic assembly equipment for a major Japanese LCD flat panel display manufacturer in Shanghai, China. 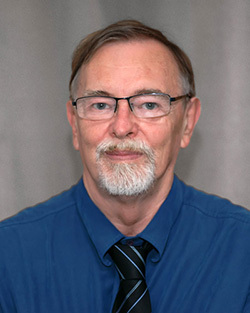 His engineering experience covers Process Logic Control systems, optical path design and alignment of laser trimming units, servo motor systems and controllers, and other mechanical control systems. Neo speaks fluent Mandarin and English, which allows him to readily communicate with suppliers and our manufacturing partners for ordering, technical and process issues. He is also responsible for translating correspondence, research papers, and other materials for EconoLux. Neo is a talented photographer and also does much of the product photography for the company. 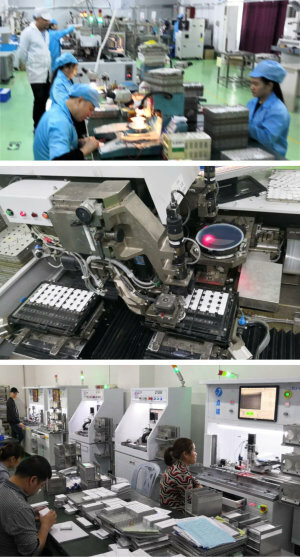 At our Bo'an LED Fabrication facility, we receive the imported LED dies (chips) from the manufacturers and test them to insure that the wavelengths are within our exacting tolerances. The LED dies are then sent to the assembly clean-room facility, where they are prepared for use with the Pick & place machines that insert them into COB holders, or onto specially prepared PCBA's (aluminum PCBs). Once the dies are bonded to the COB holder base plate, we use 99.99% pure gold wire to connect the LED dies in a series parallel arrangement. Once the COB has reached this stage, we mix the dry phosphor powder with the carrier, and place the mixture in a vacuum chamber to remove all of the trapped air. Once the phosphor has been de-gassed, it can be coated onto the COB. The COBs are then placed into an oven to 'cure' the phosphor. The LEDs are then tested and 'aged' before being sent to the fixture assembly facility. At our faculty we have optical testing equipment including integrating spheres, pick & place machines, wire boning equipment, automated plastic phosphor retaining dam making machines for use with PCBA LED assemblies, automated liquid phosphor application systems, phosphor weighing and mixing equipment including vacuum chambers, curing ovens, ageing/testing equipment, and QC verification equipment. At our Longgang fixture assembly facility, we design the parts and extrusions that make up our housings. We cut the extrusions, CNC machine them as necessary, paint or powder coat the parts, and assemble the housings before they are sent to the next step in the fixture assembly process. The next step is to install the LED COBs, or LED PCBAs, into the housings taking care to insure proper thermal transfer. The lenses and seals are added to meet the IP standard specified. The drivers, usually imported high quality MeanWell drivers, are installed into the housings and all electrical connections are made. The competed fixtures are then aged (tested at full output, usually overnight) to be sure they are functioning correctly, After the ageing test is completed, the finished lights are labelled and packed for shipment. 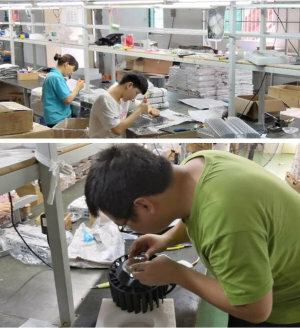 At all stages of the production of our LED Plant/Grow lights, we diligently test the components and sub-assemblies to be sure that the meet, or exceed, our requirements. This way we can be sure we are delivering the maximum quality of product to you, our customers. EconoLux Industries Ltd. is dedicated to providing scientifically designed, energy saving, LED Plant/Grow/Hydroponics lighting. We have semi-custom models of our lights, or our OEM department can creates any format of grow-light, with any spectrum you need or specify. We can make these lights with your colour scheme, your logo and branding printed onto them, as your own private brand of LED grow-lights. These will be made by us on a confidential basis. For more information pleases see our OEM and Custom LED Grow-lights page, or Contact us.